Nous savons peu de choses de la manière dont les politiques municipales et communautaires identifient et protègent les bâtiments, les rues et les paysages ou ensembles culturels « historiques ». À partir des expériences de la ville de Mississauga, prospère dans son ensemble et en croissance rapide, et de la Municipalité régionale de Cap Breton, aux prises avec des difficultés économiques, cet article s’enquiert des indicateurs objectifs qui pourraient être utilisés à l’avenir dans les études multi-municipales pour évaluer jusqu’à quel point l’ethos de la conservation historique s’inscrit dans la gestion municipale. Il est essentiel de prendre la mesure de la proportion des ressources humaines consacrées à la planification de la conservation du patrimoine sur l’ensemble des planifications, de même que d’évaluer les compétences et les qualifications des membres du comité municipal en matière de patrimoine. Cet article considère donc plusieurs conditions préalables plausibles à un fort ethos « conservationniste » municipal et détermine l’importance de la perméabilité du système politique local aux classes intellectuelles et culturelles. Une telle perméabilité peut être une aberration en beaucoup d’endroits, tendant à émerger durant les périodes de crises ou de désorganisations politiques et économiques. Les partisans de la conservation du patrimoine seraient donc bien avisés de tirer avantage de toutes les ouvertures politiques possibles pour s’assurer non seulement des victoires sur les dossiers en cours, mais également de réformes institutionnelles plus profondes et soigneusement préparées. We know little about municipal and community politics in Canada as they relate to identifying and protecting “historic” buildings, streetscapes, districts and cultural landscapes. 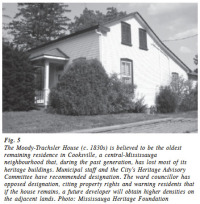 Drawing on the experiences of the rapidly growing and generally prosperous city of Mississauga and the economically struggling Cape Breton Regional Municipality, this paper enquires into the objective indicators that could be used in future multi-municipality studies to gauge the extent to which an historic-preservation ethos is embedded into municipal governance. Measuring staff resources dedicated to heritage planning as a proportion of overall planning is critical, as is appraising the competencies and qualifications of members of the municipal heritage committee. This paper then considers several plausible preconditions to a strong municipal preservationist ethos and settles on the importance of the permeability of the local political system to the intellectual and cultural classes. Such permeability may be an aberration in many places, tending to arise during periods of political and economic crisis or dislocations. Preservationists may therefore be well advised to take full advantage of political windows of opportunity to secure not only victories on active files, but deeper, carefully designed institutional reforms. 2 We nevertheless have very limited research and analysis on why some communities are determined to preserve and others are not. Is affluence a precondition? Is it education? Is it the orientation of the local economy, or the extent of the pressure from development or redevelopment? Is it the idiosyncratic and unpredictable impact of individual leaders? Are preservationist communities simply, in the first instance, more beautiful and historic than their less preservationist counterparts? In endeavouring to posit plausible hypotheses, and to grapple with how to measure the extent to which a preservationist ethos is embedded into the governance of municipalities, this paper compares and contrasts the politics of local historic preservation in two very different Canadian municipalities: the economically struggling, formerly industrial Cape Breton Regional Municipality and the generally affluent, rapidly growing suburban city of Mississauga. 3 These municipalities, however, tend to resemble each other with respect to the dependent variable. Overall, both appear to have poor preservation records, but there have been promising results in some neighbourhoods and during some periods in the recent past. Drawing from personal interviews, committee and archival records, heritage inventories, research on local histories and an attempt to situate historic preservation in the context of the general issues and objectives of the respective communities,3 this paper proposes that the municipal preservation ethos can best be gauged by calculating staff resources dedicated to preservation as a proportion of all planning issues and by appraising the level of activity (including frequency of meetings) of the municipal heritage committee. It also is argued that a strong local preservationist ethos appears to be associated with a political or economic climate that allows members of the intellectual and cultural sectors to play prominent, influential roles in local governance. 4 In the wake of Canada’s Centennial celebrations and the emergence of new international instruments and declarations on vernacular heritage, especially the UNESCO World Heritage Convention (1972), Canadian jurisdictions began to reappraise their old buildings and neighbourhoods.4 A growing appreciation for local history led in many places to the identification of buildings and properties associated with famous individuals and events. Urban reform movements complemented these efforts by emphasizing historic buildings as contributors to the aesthetic and distinctive qualities of neighbour-hoods, and as bulwarks against undesired transportation and infrastructure projects. Historic-preservation advocacy thus figured in the famous resistance to the proposed Spadina Expressway in Toronto. In Halifax, the effort to rescue from the wreckers’ ball the 200-year-old “Historic Properties” was part of the successful struggle against an expressway proposed for the waterfront. The establishment, in 1973, of the Heritage Canada Foundation, modelled after the already-prominent National Trust in the United States, also helped to raise consciousness. 8 This researcher’s reviews of municipal-council and heritage-committee minutes, attendance at municipal meetings and discussions with local historians, heritage advocates and municipal staff all tended to reveal that historic-preservation planning and political advocacy have generally been marginal to the overall planning and politics of both municipalities. Although local organizations have documented the histories of many buildings and streetscapes and developed community museums, their engagement in local political processes appears to have been limited. (They do, however, lament the losses of historic landmarks.) In both places, municipal officials seldom will resist developments that threaten even exceptionally old or unique properties. 9 But the picture is not one-dimensional. The smallest of Mississauga’s predecessor municipalities, Streetsville (population 7,000), was assertive on historic-preservation matters. It had developed a comprehensive inventory of historic properties, against which planning applications were checked. Compromises were sought with those who proposed to demolish.8 Mississauga’s first post-amalgamation council (1974-76) was dominated by a slow-growth reform movement that immediately established a Preservation of Historic Buildings Committee, of which the mayor himself was a member. Although the Ontario Heritage Act had yet to be passed, this committee began forthwith to identify historic buildings. After the Act came into force, Mississauga was among the first municipalities in Ontario to initiate heritage designations. In 1982, after several years of careful planning, Mississauga became home to Ontario’s first heritage conservation district (Meadowvale Village). 10 After 1982, however, heritage identification and planning slowed considerably. There have been almost no heritage designations without the owner’s consent or request. In 1992, the City even repealed designation of one of its own heritage buildings, Mississauga’s only example of the Prairie style of architecture. An elderly tenant was evicted to make room for an overflow parking lot. All this took place against the advice of the heritage committee.9 In 1994, the heritage committee was restructured, eliminating the privilege enjoyed by organizations like the Mississauga Heritage Foundation to nominate people whom they regarded as experts or champions of heritage. All members henceforth would be named directly by city council. The committee was put under the chairmanship of a relatively unsympathetic councillor. Meanwhile, the heritage coordinator lost his only assistant, leaving one full-time staff member to deal with matters of historic preservation. This left little time for anything but processing routine applications for alterations of already-designated heritage properties. Only recently, with the creation of a heritage conservation district in Old Port Credit Village, at the strong urging of many of the local residents, have there been signs of a possible renaissance of heritage advocacy and policy in Mississauga. Fig. 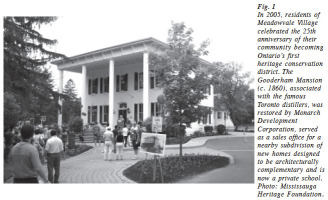 1 In 2005, residents of Meadowvale Village celebrated the 25th anniversary of their community becoming Ontario’s first heritage conservation district. The Gooderham Mansion (c. 1860), associated with the famous Toronto distillers, was restored by Monarch Development Corporation, served as a sales office for a nearby subdivision of new homes designed to be architecturally complementary and is now a private school. Photo: Mississauga Heritage Foundation. 11 The Cape Breton Regional Municipality appears also to have been sluggish. Only three properties have been designated since amalgamation. Two took place at the request of the owner, and the third was the designation of the municipally owned Glace Bay Town Hall, but only after the applicant, the Glace Bay Heritage Museum Society, promised to restore it within a year so that it would not be a burden on the municipality.10 The municipality’s Heritage Policy defines the “applicant” for designation as “the owner”—and the said party must pay $285 to obtain a designation, although the encumbrance of a designation could well be characterized as a contribution to the community. Until 2005, the heritage committee seldom met. The minutes of a 1998 meeting report that municipal staff advised members that, “There is no set criteria on the number of times the Committee has to meet; it will depend on the number of applications which are received.”11 Few property owners have been insisting on designations and thus the committee has been largely dormant. Fig. 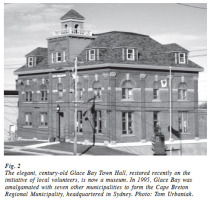 2 The elegant, century-old Glace Bay Town Hall, restored recently on the initiative of local volunteers, is now a museum. In 1995, Glace Bay was amalgamated with seven other municipalities to form the Cape Breton Regional Municipality, headquartered in Sydney. Photo: Tom Urbaniak. 12 That being said, in 2004 the municipality began a comprehensive consultation in which a heritage conservation district for the “North End” of Sydney was being put forward as a serious option. At the time of writing, this was close to coming to fruition.12 One experienced planner now spends much of his time on historic-preservation matters. Presently, the focus is primarily on the North End, although he speaks of the possibility that other districts will soon be considered. The North End is a largely neglected neighbourhood, one of the poorest in Sydney, but it is home to Cape Breton’s oldest buildings, including St. George’s Anglican Church (1785) and the Cossit House (1787), which are a quarter-century older than the oldest building in Mississauga. The neighbourhood (the original Sydney townsite) was established in 1785 by Col. Joseph Wallet DesBarres, the first British governor of the Colony of Cape Breton.13 In recent years, as cruise-ship traffic to the Port of Sydney has increased, the North End has come to be regarded as an alluring venue for “ghost walks” organized by the Old Sydney Society. The society operates (by itself, or in partnership with other non-profit groups) four museums in the North End. Fig. 3 St. George’s (c. 1785) was the fourth Anglican church to be erected in Canada. Home to a famous chair from Admiral Nelson’s HMS Victory, it is the most visible structure in Sydney’s North End. The area is slated to become Cape Breton’s first heritage conservation district. Photo: Tom Urbaniak. 13 These observations, however, lead only to superficial conclusions about the local preservation ethos. How are we to measure such admittedly ambiguous concepts as “the strength of the historic-preservation ethos” or “the prominence given to historic preservation in municipal governance”? Is a complex index required? Is a single indicator strong and revealing? 14 In principle, we should be able to calculate the number or proportion of heritage properties that have been lost or rescued as a result of determined effort. This, however, presents some difficult problems. Are there objective criteria for what constitutes a heritage property?14 In the 1970s and 1980s, the Canadian Inventory of Historic Building, with the help of local governments and organizations, tried to identify all pre-1914 structures in the country. Even if we accept the dubious proposition that structures erected before 1914 are “heritage” and others are not, the rate of loss would not necessarily tell us how strong has been the resistance against loss, how effective or assertive that resistance has been relative to the level of threat or how proactive have been the efforts to save what remains. 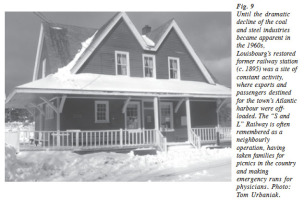 Moreover, it is believed that most pre-1914 buildings never were actually identified, and thus comprehensive lists (and acknowledged losses) may be reflective of a high level of local (and even municipal) heritage activism. 18 A tangible indicator of the intensity of municipal historic-preservation efforts, and their relative importance in the planning process, may be the number of municipal designations. This should not be taken too far, however, because by this indicator Mississauga would be judged to be dramatically more preservation-oriented than CBRM. The former has 101 individually designated properties, plus 104 structures within the Old Port Credit Village Heritage Conservation District and approximately 65 within the Meadowvale Village Heritage Conservation District. CBRM has only 20 properties designated by the municipality or the province. Mississauga, unlike CBRM, also has an official Heritage Inventory of more than 700 properties. Although Mississauga does not, ultimately, have the authority to prevent demolition of a listed but not designated building, it can request a “heritage impact statement” to fully document the site before fulfilling a demolition request or planning application. Fig. 4 “The Grange” (c. 1828) is a Regency-style cottage built as a retreat for John Beverley Robinson, member of Upper Canada’s Family Compact, attorney general, and later chief justice. Erindale’s prominent Adamson family owned it for many years. It is now the office of the Mississauga Heritage Foundation. Photo: Mississauga Heritage Foundation. 21 A similar case in Mississauga involved the Kennedy House, a dilapidated century home on Streetsville’s main thoroughfare. In 1997, new owners Atiya and Ghani Ahsan began restoring it, at their own expense, to serve as a multicultural art gallery.23 But in the process they had to mobilize sympathetic citizens to overcome the obstacles to a minor zoning variance to allow the building to be used for purposes other than residential. 22 To this day, neither the Louisbourg Anglican rectory nor the Streetsville Kennedy House have heritage designations. The outcomes (restoration and adaptive reuse) can nevertheless be classed as preservation successes, although it is acknowledged that the presence of so many obstacles might be indicative of a less-than-hospitable policy environment for historic preservation. 23 Perhaps, then, we should find some method of calculating the likelihood that the municipality will resist heritage demolition—that is, the probability of protest or advocacy from residents or groups, and some efforts by the municipal council and staff to find preservation-oriented solutions. Such calculations are potentially revealing, but making them accurately would be a very trying enterprise. 24 Because development and redevelopment pressures will vary from place to place, the frequency of resistance may have to be expressed as a ratio, in which case we again will need to have some objective assessment of which demolitions should have been resisted. If little has been done to identify and catalogue properties of historic interest, then this exercise could be exceptionally difficult. Furthermore, even if we undertake the said cataloguing ourselves (of existing and lost heritage buildings), we will have to make some allowance for local values and endeavour to immerse ourselves in these. For example, in the Maritimes a 1920s Dutch Colonial Revival house would be considered relatively common and perhaps not especially noteworthy,24 but it would likely be of heritage interest in Mississauga, where it is much less common. 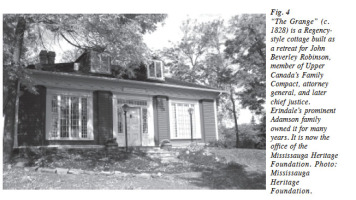 In CBRM, a property associated with Sir John George Bourinot, the renowned Canadian expert on matters parliamentary, would probably be significant, as would, in Mississauga, a property with close ties to the firebrand rebel politician William Lyon Mackenzie or one of his nemeses, former Upper Canadian attorney general John Beverley Robinson. 26 It is also possible to conceive of a municipality that is relatively progressive with respect to heritage while seldom fighting last-ditch battles. This may be the result of strong, proactive heritage policies that confront developers and redevelopers as part of the generally understood rules for doing business in the community. The heritage losses may thus actually represent minor concessions in what is actually a substantive and progressive policy environment. 27 A more compelling indicator of the prominence of the historic-preservation ethos in municipal governance may be the municipal staff time, as a proportion of all staff time spent on planning, devoted to historic-preservation matters—designation, negotiation, commemoration, education and so on. Likewise, the frequency of meetings and the prominence and level of expertise of members of the heritage committee would seem, prima facie, to be sound indicators that historic preservation enjoys an important place on the municipal agenda. 28 It has already been noted that CBRM’s recent foray into planning for a heritage conservation district has been accompanied by assigning a senior planner to spend considerable time on historic preservation. Mississauga’s staffing reduction coincided with a virtual halt to designations and almost no apparent resistance to demolitions, although in 2005 the City did finally reintroduce a second staff position for heritage conservation matters. 29 In CBRM, for the first time since amalgamation, the Heritage Committee has begun meeting regularly. It now includes among its number feisty historical-society representatives, and is chaired by a councillor who has been generally supportive of a heritage conservation district.26 In Mississauga, beginning in 2004, a more preservationist councillor took the helm of the Heritage Advisory Committee. Although the plans for the Old Port Credit Village heritage district were already well in progress by this time, and despite a controversy in 2005 in which one of the councillors relentlessly opposed a recommendation from City staff and the Heritage Advisory Committee to designate a rare saltbox pioneer homestead in his ward,27 the changing of the guard at the HAC does appear to coincide with some renewed local interest in preservation matters. 30 Ultimately, some effort should be probably expended on developing a defensible scoring system. It would give weight, for example, to the extent to which outside organizations are requested to nominate or appoint members of the municipal heritage committee, and there would be some method for determining the level of knowledge and expertise of those members. Such an investigation may entail one-on-one surveys of members to gauge their familiarity with the planning process, heritage legislation and other potential tools for preservation, such as easements, development agreements, density bonusing, community-improvement zones, property-tax rebates and revolving funds. 31 Acknowledging the need for more rigorous work on methodology and measurement, let us speculate on the factors and preconditions that seem to be critical for a strong historic-preservation ethos to emerge in municipal governance. Based upon observations in Mississauga and CBRM, what hypotheses might merit further testing? 32 Perhaps Mississauga and CBRM would be more active on historic preservation if empowered by a stronger provincial legislative framework. Hazel McCallion, Mississauga’s mayor since 1978, has made precisely this argument. Why suffer through the grief and expense of a heritage designation or negotiation if the owner would have the legal authority to demolish in six to nine months?28 A similar calculation or rationalization may apply in CBRM. Why not defer heritage designations to the provincial government, with its permanent demolition-control powers, rather than going through the aggravation merely to institute a delay? Fig. 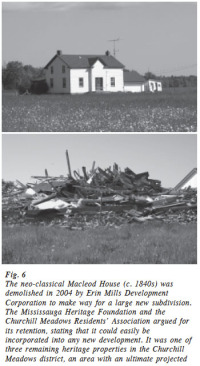 6 The neo-classical Macleod House (c. 1840s) was demolished in 2004 by Erin Mills Development Corporation to make way for a large new subdivision. The Mississauga Heritage Foundation and the Churchill Meadows Residents’ Association argued for its retention, stating that it could easily be incorporated into any new development. It was one of three remaining heritage properties in the Churchill Meadows district, an area with an ultimate projected population of 55,000. Photo: Mississauga Heritage Foundation. 36 Anthony Tung presents a variation of the beauty thesis. He suggests that cities with strong preservation impulses regard themselves as organic wholes, as living entities.33 On that basis, we might expect that municipalities with scattered, disparate, non-contiguous communities—such as those in Mississauga and CBRM—will be weak with respect to preservation. 38 With regard to Mississauga’s predecessor municipalities, we might ask why Streetsville apparently was assertive on historic preservation, while Port Credit was not. Both were compact communities with unique and recognizable landmarks. Both were under major development pressures. Why was there intensive preservation activity for several years in the new City of Mississauga, when the municipality’s communities were even more disparate and isolated from each other than they are now? Why is CBRM suddenly now becoming more active? 40 Might the sudden emergence of municipal efforts to preserve the North End of Sydney, despite the absence of direct development pressure on that neighbourhood, be related to the area’s recent discovery by cruise-ship passengers? Is historic preservation coming to be considered integral to the economic future of CBRM? 42 In Mississauga, it could certainly be contended that historic preservation has never been considered integral to economic growth. Since World War II, the municipality has been in the path of major, almost inevitable development. Its prime location— as home to Canada’s largest airport and more expressways than any other city in the country— has been a draw for major corporations. More than 50 of the Fortune 500 companies have their Canadian head offices in Mississauga. Cultivating the “quality of place” (including “historical authenticity”) that many economic development experts, most notably Richard Florida,38 deem to be integral to the future prosperity of cities has thus far been considered neither critical nor urgent in Mississauga. 43 Yet neither the former municipality of Streetsville, nor the first council of the city of Mississauga, which appear to have been very active on heritage matters, justified preservation in economic terms. Perhaps, then, we must also look for the circumstances that cause municipalities not to adhere strictly to Peterson’s thesis. When do “quality-of-life” issues supersede economic-development considerations? 44 Urban regime theory proposes that local governance tends to be the product of an informal, enduring coalition between a reasonably cohesive group of public and private actors. The tenor and priorities of the local government are determined by the composition of the coalition. 47 Similarly, the recent increase in the status enjoyed by historic preservation in CBRM appears not to coincide with any increase in the proportion of residents who could be classified as members of the noncorporate middle class. The overall economy and fiscal realities have not yet improved since the closure of the steel plant and coal mines.43 Stone’s observations thus may be salient in some places, and it may be true that the leading preservationists are drawn from the noncorporate middle class, but his explanations are obviously incomplete. They do not help us to understand the circumstances and considerations that open up municipal governance to the preservationists. 48 It is apparent that in both CBRM and Mississauga the leaders of preservation movements have tended to be intellectuals (often university academics) or those who work in the cultural sector, especially arts-related endeavours. Perhaps the terms “non-corporate middle class,” and even Richard Florida’s “creative class” (which includes, for example, innovators in the technology sector), are categories that are too broad. Furthermore, most of the especially active preservation-movement leaders appear not to be associated with the old families. Indeed, it appears that many were not raised in the communities whose history they are trying so hard to preserve. 51 In Mississauga, during the heyday of the municipal heritage committee, professors like Anthony Adamson (restoration architecture and planning) and Thomas McIlwraith (cultural geography) were leading the body. After the 1994 restructuring of the committee, no one who was prominent in the cultural or intellectual life of the city was appointed. 53 Then again, there do tend to be variations in the extent to which municipal political systems are open to such individuals. In Cape Breton, with the collapse of the coal and steel industries, the population, although still primarily of a working-class background, is coming to perceive that a prosperous and stable future may lie in the knowledge and cultural sectors. New investment, new middle-class/creative-class residents and tourists can be attracted by Cape Breton’s famous scenery and pleasant communities. Courting mega-projects, and the hope that outside corporate investors will be Cape Breton’s salvation, are no longer regarded as imperative or realistic. Fig. 7 The “company houses” of industrial Cape Breton are distinctive but under-appreciated cultural-heritage resources. The row houses (top, c. 1850s, Sydney Mines) are the least typical. 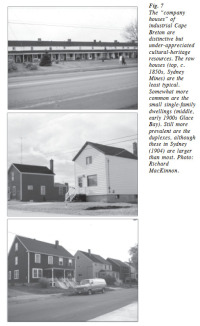 Somewhat more common are the small single-family dwellings (middle, early 1900s Glace Bay). Still more prevalent are the duplexes, although these in Sydney (1904) are larger than most. Photo: Richard MacKinnon. 55 A heritage trail system is being planned for the historically vibrant, multicultural, working-class Sydney neighbourhood of Whitney Pier. “We should charge admission to the Pier,” one resident quipped at a 2005 public hearing of Nova Scotia’s Heritage Strategy Task Force.51 Canada’s only African Orthodox Church, a Jewish synagogue (now the Whitney Pier Historical Museum), a Ukrainian Catholic Church and a Polish Roman Catholic Church are among the features of the neighbourhood’s eclectic cultural landscape, though many of the small businesses have closed. But the haze from the steel plant is gone, and the community below is being touted, probably more than ever, as a treasure of cultural geography— and an important attraction. With this new aesthetic and economic orientation, the skills and values of residents who are members of the intellectual and cultural sectors may come to be more prized than ever. Fig. 8 St. Phillip’s African Orthodox Church, completed in 1928, is one of the landmarks in the multicultural, multiracial, working-class Sydney neighbourhood of Whitney Pier. The community sat in the shadow of the now-dismantled steel plant. Photo: Tom Urbaniak. Fig. 9 Until the dramatic decline of the coal and steel industries became apparent in the 1960s, Louisbourg’s restored former railway station (c. 1895) was a site of constant activity, where exports and passengers destined for the town’s Atlantic harbour were off-loaded. The “S and L” Railway is often remembered as a neighbourly operation, having taken families for picnics in the country and making emergency runs for physicians. Photo: Tom Urbaniak. 59 In Mississauga, the influence of the historic preservationists was in ascendancy during a period of great political fluidity, but not economic crisis. In 1973, the reform candidates toppled a majority of the once-well-entrenched and developer-oriented “old guard.”58 Between 1974 and 1978, the reform and old-guard factions battled constantly on the city council. “It was big-city politics; it was great,” a former reporter told me.59 In this more open political environment, the intellectually and culturally oriented residents could find a place. 63 Thus, a local political system may become impenetrable to the cultural or intellectual sectors for different reasons—including a political culture or economic orientation that embraces a “red” as opposed to “green” perspective on progressivism, or an unusually strong mayor without a strong preservation ethos. There may of course be in the general population a total absence of residents associated with the intellectual or cultural sectors. As we have seen, however, they need not be present in large numbers to make a political impact when other factors have converged in their favour. 64 The formulation of a theory to explain and predict which communities preserve will ultimately require not only a “large N” approach, but more careful criteria with respect to the variables. We must also avoid tautological arguments—as in, “a community is preservationist because there are people who are strong preservationists.” We must thus determine who, precisely, would qualify as a member of the intellectual and cultural sector. Will the criteria be based strictly on occupation, or could career volunteers qualify? How do we know that a system is more or less amenable to such people? If we focus strictly on their presence on the municipal heritage committee, then we risk making the independent and dependent variables congruent. One remedy might be to remove any examination of the personnel of the municipal heritage committee in determining the extent to which a preservation ethos is embedded into municipal governance—or we might even consider transferring this analysis from the dependent to the independent variable. 65 At the risk of oversimplification, the factors contributing to CBRM opening municipal governance to intellectuals and those active in the cultural sector appear to have been economic, whereas the same permeability in Mississauga was present when the political priorities shifted away from considerations of economic development. Both experiences may suggest, again tentatively, that anything more than cursory municipal attention to historic preservation is an aberration, occurring during periods of great flux. It will thus be critical to watch events in CBRM to examine whether the growing municipal interest in historic preservation will establish itself as an enduring and critical part of the new Cape Breton economy. 66 If preservationist impulses seem to be fleeting, then the lesson for preservationists may be to pursue institutional changes while their cause enjoys some currency at the municipal headquarters. This may mean writing global policies and bylaws and not simply focusing on individual properties. Historical property lists compiled by historical societies could be incorporated into a municipal heritage inventory (whether or not the properties are to be promptly designated). Policies could require that planners’ computer databases raise alerts when such properties are threatened by development or building applications. A written protocol for negotiation and for revealing the issue to the municipal heritage committee could then be invoked. As in the Charleston case, a revolving fund could be established with an initial lump sum sufficient to rescue a single heritage property. This could then be replenished once the property is sold, with an easement attached, to a sympathetic owner. If properly managed (usually by a separate, arms-length group), such a fund could live perpetually and thus serve to keep preservation in the public eye. Preservation groups might also insist on authority to appoint some of the members of the municipal heritage committee. 1 Anthony M. Tung, Preserving the World’s Great Cities: The Destruction and Renewal of the Historic Metropolis (New York: Three Rivers Press, 2001). 2 See, for example, the case studies described in Richard Moe and Carter Wilkie, Changing Places: Rebuilding Community in the Age of Sprawl (New York: Henry Holt and Company, 1997). 3 The author has also had direct involvement with heritage issues in both municipalities, having been a volunteer with non-profit charitable organizations. I served on the board of the Mississauga Heritage Foundation from 2002-2005 and on the board of Community Heritage Ontario in 2004-2005. I have been a card-carrying member of the Old Sydney Society since 2004. 4 “For this  was the year when Canadians gained a sense of their own past, often for the first time,” writes Pierre Berton. “The outpouring of books that accompanied the Centennial turned many Canadians into history buffs—an enthusiasm that carried over into the next decade, a phenomenon to which I and many other writers can attest.” 1967: The Last Good Year (Toronto: Doubleday, 1997), 48. 5 Ontario’s 1975 Heritage Act, which had been amended only in minor ways, was superseded on April 28, 2005, by a new and much stronger Heritage Act. This is discussed later in the paper. For a good overview of the legislative framework in all the provinces, see Marc Denhez, “Conservation, the Role of Heritage Districts, and the Ontario Heritage Act,” in Community Heritage Ontario, Heritage Conservation Districts: A Collection of Papers and Notes From Workshops Held in 2003 and 2004 (Scarborough, Ont. : Community Heritage Ontario, 2005), 6. 6 City of Mississauga, Planning and Building Department, Mississauga: The Evolution of a City (Mississauga: February 2004). 7 See, for example, Wade Locke and Stephen Tomblin, Good Governance: A Necessary but Not Sufficient Condition for Facilitating Economic Viability in a Peripheral Region: Cape Breton as a Case Study, prepared for the Cape Breton Regional Municipality (Sydney, Nova Scotia: Cape Breton Regional Municipality, 2003). 8 See, for example, Tom Urbaniak, Farewell, Town of Streetsville: The Year Before Amalgamation (Belleville, ON: Epic Press, 2002). 9 For detailed and revealing documentation on this issue, see “Adamson Estate – 88” file, Box 7 and “Adamson Estate – 90” file, Box 8, both in Harold Kennedy papers, 95.0015, Region of Peel Archives. 10 Minutes, Heritage Advisory Committee, Cape Breton Regional Municipality, 13 January, 2000, Office of the Regional Clerk, Civic Centre. 11 Minutes, Heritage Advisory Committee, Cape Breton Regional Municipality, 20 May, 1998, Office of the Regional Clerk, Civic Centre, 3. 12 The author attended most of the community meetings in the fall and winter of 2004-2005. 13 See, for example, Debra McNabb, Old Sydney Town: Historic Buildings of the North End, 1785 to 1938 (Sydney: Old Sydney Society, 1986). 14 The Ontario Ministry of Culture has attempted to put forward some criteria. However, even these leave considerable room for subjective judgement. The three principal categories are “Design/Physical Value,” “Historical/Associative Value” and “Contextual Value.” A property falling under the second category is described as “associated with a theme, event, belief, person, activity, organization or institution that has made a significant or unique contribution to a community; or yields information that contributes to an understanding of a culture or community.” See Ministry of Culture, Ontario’s Heritage: Creating a Culture of Conservation, Ontario Heritage Act Workshop, Mackenzie Hall, Windsor, 29 April, 2005; Section 6, 5. 15 Robert Morgan, interview with author, 19 May, 2005, Sydney, Nova Scotia. 16 J. G. MacKinnon, Old Sydney (Sydney: Old Sydney Society, 1989 ), i. 17 Robert Morgan, “Speech delivered on the Occasion of the 195th Anniversary of the Foundation of St. George’s,” Sydney, Cape Breton, 23 April, 1980. MG 12, 82, 29, Pamphlet 27, Beaton Institute, Cape Breton University, 6. 19 On October 14, 2004, this writer attended an auction for the theatre. On the block was the building and its one acre of land in the downtown. The longtime owners had hitherto been unsuccessful in finding a buyer. There was only one bid—for $125,000. The bidder was representing an off-island prospective buyer, whose identity was not revealed. The prevalent rumours in Sydney, however, are that the theatre will be demolished. 20 Victor Hanham, interview with author, 19 May, 2005, Louisbourg, Nova Scotia. 21 See, for example, Minutes, Mississauga Heritage Advisory Committee, 5 July, 2004, Office of the City Clerk, Mississauga Civic Centre. 22 Bill O’Shea, Louisbourg Heritage Society, interview with author, 13 May, 2005, Louisbourg, Nova Scotia; Rick McCready, interview with author, 11 May, 2005, Sydney, Nova Scotia. McCready, now a planner for CBRM, worked previously for the Louisbourg and District Planning and Development Commission. The commission was established by the province as the fortress was being restored, in anticipation of a major influx of tourists and ostensibly to prevent tacky and incompatible development from dominating the approaches. But the development pressures were limited and the commission re-oriented itself to helping to cultivate and attract new enterprises. 23 See, for example, “The Vision for the Kennedy House,” www.learningclub.ca/ourstory.htm. 24 See, for example, Stephen Archibald and Sheila Stevenson, Heritage Houses of Nova Scotia (Halifax: Formac, 2003). 25 See, for example, Old Port Credit Village—Draft Heritage Conservation District Plan, December 2003, Office of the Mississauga Heritage Foundation, Robinson-Adamson Grange, Erindale. 26 Rick McCready, interview with author, 11 May, 2005, Sydney, Nova Scotia. 27 This is the pre-1850 Moody-Trachsler Homestead, believed to be the oldest residence in the high-density Cooksville community. The designation recommendation covers only the house, which sits at the corner of the property, and not the rest of the one-acre parcel, which could be developed. The owners, who inherited the property in 2004, are three members of Toronto’s Summerville family, a family well known in political and business circles. They and the ward councillor for Cooksville, Nando Iannicca, have opposed the designation, citing property rights. 29 Author’s notes, meeting of Mississauga city council, 25 May, 2005. 30 Mike Funston, “Mississauga councillor seeks protection for historic buildings,” Toronto Star (21 February 1989). 31 See, for example, Tom Urbaniak, “City tax report long in coming,” Mississauga Booster (27 August 2003). 32 Tung, Preserving the World’s Great Cities, Chap. 4. 33 Ibid., cf. 27, 417. 34 See, for example, Robert R. Weyeneth, Historic Preservation for a Living City: Historic Charleston Foundation, 1947-1997 (Columbia: University of South Carolina Press, 2000); and Sidney Bland, Preserving Charleston’s Past, Shaping Its Future: The Life and Times of Susan Pringle Frost (Columbia: University of South Carolina Press, 1999). 35 Paul Peterson, City Limits (Chicago: University of Chicago Press, 1981). 36 Robert Morgan, interview with author, 19 May, 2005. 37 Rick McCready, interview with author, 11 May, 2005. 38 Richard Florida, The Rise of the Creative Class – And How It’s Transforming Work, Leisure, Community, and Everyday Life (New York: Basic Books, 2004); see especially ch. 12. 39 Clarence N. Stone, “Urban Regimes and the Capacity to Govern,” Journal of Urban Affairs 15 (1993): 1, 1-28. 40 See, for example, Mark E. Kann, Middle-Class Radicalism in Santa Monica (Philadelphia: Temple University Press, 1986). 41 In 1996, consultant Dory Vanderhoof warned the Mississauga Arts Council that a sophisticated market for culture, although growing, would take 25 more years to become a significant cohort in the population. Vanderhoof rather poetically “described potential ticket buyers [for the Living Arts Centre] as mortgaged-tothe-hilt yuppie parents who drive Toyota Previas, buy Vidal Sasoon shampoo, shop at Miracle Mart, listen to traffic reports and read The Financial Post and Today’s Parent. They are highly educated, like to each take out food and are more likely to attend an amusement park with their kids than they are to go to a theatre.” Gerry Timbers, “LAC faces tough sell for next 25 years,” Mississauga News (29 May, 1996). 42 David O’Brien (City Manager) and Janice Baker (Treasurer), TD Forum on Canada’s Standard of Living: Building Sustainable Communities, 2002, 5. (www.td.com/economics/standard/full/o’brien.pdf). 43 Locke and Tomblin, Good Governance. 45 Bill O’Shea, interview; and Victor Hanham, interview. 46 For a brief description of the town-hall restoration, see “The Old Town Hall 2003” in Glace Bay Museum Society, Centennial Cookbook 1901-2001. 47 Meilleur has spoken passionately about this in informal, small-group conversations at which this writer was present, in my capacity as a board member of Community Heritage Ontario. She also made similar remarks publicly in her address to the joint conference of Community Heritage Ontario and the Architectural Conservancy of Ontario, 29 April, 2005 (author’s notes, taken at conference). 48 This writer has witnessed these debates in recent months, at meetings of the CBRM council. 49 Ekistics Planning and Design in association with ADI Ltd., Wentworth Park Revitalization Plan: Final Report, 4 December, 2003 (Planning Department, Cape Breton Regional Municipality). 50 Dr. Richard MacKinnon, Cape Breton University, interview on Main Street, CBC Radio One—Cape Breton (6 December, 2005, 5:15 p.m.). 51 Author’s notes, hearing of the Nova Scotia Heritage Strategy Review Task Force, Membertou, Nova Scotia (7 November 2005). 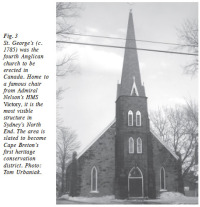 52 Terry MacLean, Louisbourg Heritage: From Ruins to Reconstruction (Sydney: University College of Cape Breton Press, 1995), 19. 54 See, for example, Canadian Institute for Research on Regional Development, Economic Adjustment in Selected Coastal Communities, April 1995. (Reports – Economy, Beaton Institute, Cape Breton University), 111-27. 55 Former Toronto councillor (and history professor) William Kilbourn defined “tory radicalism,” with which he associated himself, as follows: “It is to be radical in the rejection of the ugliness that dominates so much of our community. It is to be tory in the commitment to the good values and amenities of the past which are being eroded away.” See “Confessions of a City Hall Clubman,” City Hall, April 1970, reprinted in Kilbourn et al., Inside City Hall: The Year of the Opposition (Toronto: Hakkert, 1971). 56 In a milieu of heavy industry, the fragility of life itself may supersede any inclinations to embrace pursuits that might be regarded as aesthetic or genteel. In one of his short stories, Alastair MacLeod writes that “most of us have accompanied the grisly remains” of persons whose lives were cut short in industrial accidents. “The Closing Down of Summer,” in MacLeod, As Birds Bring Forth the Sun and Other Short Stories (Toronto: McClelland and Stewart, 1986), 13. 57 Carol Corbin and Erna MacLeod, “Commemoration or 26 Material Culture Review 63 (Spring 2006) / Revue de la culture matérielle 63 (printemps 2006) Commiseration? : Louisbourg 1995 as Comnmunity Development,” May 1997 (in Reports—Towns and Villages—Louisbourg, Beaton Institute, Cape Breton University). 58 Tom Urbaniak, “Regime Theory and the Politics of Mississauga, 1960-76,” paper presented to the Annual Conference of the Canadian Political Science Association, Dalhousie University, 1 June, 2003. 59 Dave Cook, interview with author, 14 July, 2004, Mississauga, Ontario. 60 The historical-structural preconditions to pre-emptive, overriding mayoral leadership are examined in Tom Urbaniak, Beyond Regime Theory: Mayoral Leadership, Suburban Development, and the Politics of Mississauga, Ontario (PhD thesis, University of Western Ontario, 2005). 62 James Howard Kunstler, The Geography of Nowhere: The Rise and Decline of America’s Man-Made Landscape (New York: Simon and Schuster, 1994). 63 ICOMOS Charter on the Built Vernacular Heritage, 2000. www.international.icomos.org/vernac-eng.html.